When Julius Caesar made his expeditions to Britain, he only ventured as far as the South East before abandoning his exploration. Now it was 43 AD. and the Romans had gained complete control of the whole country. Britain was now a Roman province. 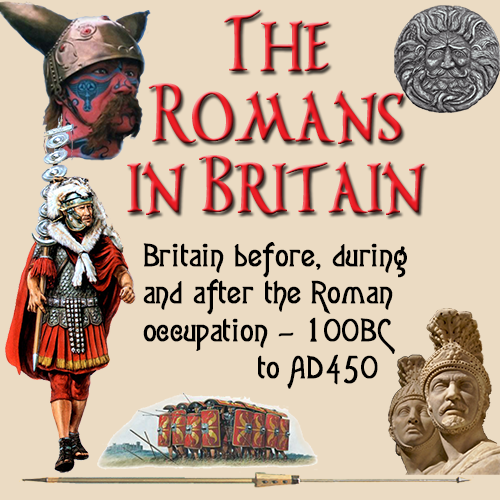 The Romans of this time were now traveling further afield to seek out more distant tribes to bring them under the Roman rule. Even though they now ruled Britain, they had not, as yet, traveled much beyond the Midlands. Their knowledge of Britain was very limited at this point, and it was the task of Plautius to take his Roman forces further north. From writings of that time and archaeological finds, it has been established that the Romans occupied an area that extended south from the Humber Estuary the Trent and West from Bristol. That is where the Romans made a big mistake. The picture was now one of a divided country. The South and South East were under Roman rule, with the tribes devoid of their weapons. The remainder of the country was still had the tribes in control of their own territories, with their weapons intact. Wars between tribes was common. So the southern tribes only had the protection of their new masters. This caused unrest amongst them, especially with those tribes that had been openly hostile to the Romans. The Romans now had an abundant supply of silver lead ore in the Mendips, iron from the South East along with other minerals that could be of use. It was the task of Plautius to bring the whole country under Roman rule and to make them into respectable Roman citizens. The Roman invasion had, so far concentrated in the lower Britain, where the land was mostly flat and of good agricultural value. Now, the next part of the occupation was to extend out north, where the landscape was more mountainous and bleak. Where the natives were independent, with a much more basic way of life than those in the South. These people would not submit so readily to becoming model citizens to a foreign power. This was not going to be much of a problem, since the Romans had years of experience in battling savage tribes in foreign lands. The Romans were not just fighters, they also used diplomatic tactics for their own ends. They had a simple political method to win land. The relationship with a selected ruler. They looked upon themselves as 'patrons', and the peoples they conquered as 'clients'. This was especially so when dealing with those having a high social status and wealth. The leaders would take great care of their people, and in return receive unshakable loyalty from their subjects. The Emperor would look upon the king of a tribe under his control as a client. He would also expect the subjects in that tribe to follow suit with their leader. The Romans would agree treaties with the tribal leaders. These would ensure they pledged allegiance to Rome, and in return would be assisted by Rome in any invasion from another force into their country, or internal revolt. The application of such an attitude secured the northern frontier, the area around the Pennines. Using their political skill, the Romans brought was inhabited by a number of minor tribes with the Parisi in the east. This was a large tribe. Prosperous and socially more advanced compared to the remainder. The brilliance of the Roman diplomatic machine managed to bring all these people under the influence of one ruler, Queen Cartimandua. She was most likely belonged to one of the leading families and held a very high position within their structure. Her position was strengthened following her marriage to Venutius, a senior in a tribe from the northern territory. Knowing the Romans, it could well be that this marriage was a political move engineered for the purposes of winning over the remainder of the tribes. this made the Roman position even more secure, with Cartimandua remaining loyal throughout the crises that arose during the next 20 years. She was powerful, and resisted all attempts by those around her to persuade her to break the treaty. The Romans were also using the same Tacitus to gain the confidence of those West of Bristol. This time they were not so successful, as a suitable leader was not found amongst these tribes. Caratacus had succeeded in gained control of these areas and with powerful Druid support, he had prevented any defections to Rome. Devon and Cornwall was occupied by the Dumnonii and they probably had a treaty with the Romans that did not quite go as far as the client relationship. The Roman occupation of the South East. The standard Roman method was to place forts in a tight placement so that each was only a one day's travel from the others around it. This would enable swift movement of personnel should any uprising occur. Coupled with this, it would prevent any hostile natives forming groups and hindering their mobility. The placement of the forts was commonly at areas were rivers cross, and along ancient routes. In Britain, this was not followed so fiercely as usual. The Romans built forts around the South east to enable them to monitor their new found subjects, and to ensure that any outbreaks of dissent were dealt with quickly and firmly. This may explain the apparent random placing of their bases. Two forts could be placed close to each other, and other parts of the country would have vast expanses without a fort in sight. The placing of the forts may have initially been on tactical, rather than logical basis. This also helped the Britons by allowing settlements to be placed near the forts which supplied services and goods to the soldiers. They supplied food, drink and those, often feminine, extras that the soldiers were deprived of, being in barrack accommodation so far from home. These settlements would also serve travelers using the many roads. Plautius set an exact western limit for his network of forts. Having decided which tribes were to be included in his province, he placed outposts at strategic points. These points were on the Rivers Trent, Avon and Severn. his became known as the Fosse Way.